Summer Borscht is a soup made with Sorrel as it's main flavour. Fresh sorrel will instantly lose it's beautiful bright green as soon as it hits the hot broth but don't let that put you off from trying this soup. It is truly delicious. If Sorrel is not available where you live, you can also use Beet leaves. Sorrel is one of the first herbs ready to pick from the garden in spring along with chives. Put the water and the ham in a large pot and bring to boil. Simmer for a few hours. Remove the bone. Add the vegetables and cook until tender. Add the meat back into the pot. Before serving, take a bowl of soup out of the pot, and slowly add the sour cream, then add it all back to the pot or let everyone put their own sour cream into their bowls. Chop up hard boiled eggs into soup. My grandma made this one...as did my mother-in-law. It was something I could easily pass by in those days...but looks quite yummy to me now. Why is that? Taste much better with Mennonite Sausage as a base. 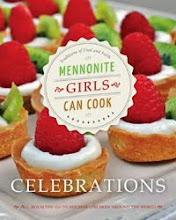 I have never had this but I do see it often in Mennonite recipes. Definitely a try. family members, my Mom's sorrel perishky got called sea weed perishky as well. Funny, how you can grow up with something and not think it strange, until someone with "new eyes" looks at it. Your soup looks good! Someone told me yesterday that they sell sorrel plants at Wal-Mart. Who would have guessed? Probably ony in our town! as kids we would sometimes call it weed soup even tho we grew up with it at home. Our kids called it summer barf ... and loved it. I make a similar soup that we called Greenleaf Borscht. My grandparents are Russian and this is something my grandma and mom made in springtime when the sorrel or greenleaves were fresh and young. I've always liked it, but my sibblings were and are not fond of it. The soup I make does not have a meat broth although I have used chicken broth to give it more flavour. It also has the addition of tomatoes! It is not an exact science... I like to cook, but I am not so good at following recipes. I go by taste and sometimes add and subtract things, so here is what I have copied down from what my mom and dad have told me. Sauté the onion in oil. Add salt and pepper. Peel and dice potatoes, add them to the onion, cover the onion and potato with water or chicken broth and bring to a boil. Simmer. Add tomatoes, sorrel and dill. Finally add diced eggs. Thanks for sharing your blog with me! Have a great sunny day! Thank you for posting this recipe. My mother-in-law is in the hospital and she just told us that she is very hungry for summa borsht, I have never made this soup,I have been looking for a recipe and now I do not have to look any further. When I go to visit her tonight I will have to tell her I have my own recipe and will make it when she comes out. Thanks again for all your recipes. Summer borscht...my g'daughter just requested this soup today! You know I've never heard of adding boiled eggs. I add summer savoury(I love this herb)to my soup, in fact I add it to all my soups. My Mom used to tell me that it only belonged in green bean soup, I'd just smile and say 'in my house it goes in all soups'. AND she loved my soups..go figure! My mom too made this soup in early Summer but also any other time (as long as she had any of her "greens" left in the freezer) I add chopped spinach if I don't have sorrel, and in place of sour cream I add buttermilk. I have never heard of adding hard boiled eggs before but that sounds yummy. Thanks for the recipe. I freeze my beet leaves all the time but have never had them turn to slime in the freezer... maybe your freezer isn't working? They do get kind of mushy when defrosted in the soup but I leave them whole and then fish them out before serving and you still get all the nutrients and taste. My father's mom made this, but we add just a little bit of vinegar before we add the cream. Never heard of hard boiled eggs. We make it several times during the summer...and in the winter with frozen spinach. My brother saves beet leaves for Mom to use. I have bowls similar to this. They were made in Australia, but they must have been a copy. My mom also made this soup, my favorite. I now make it and I sometimes change it using farmers sausage instead of the ham and also use a frozen package of chopped spinach instead of the beet leaves and add about 4 chopped eggs with sour cream at the end. my mom and dad always made sauerkraut borscht and made the best. here goes dep[ends how much you want to make. a big pot or medium pot. well about a large quart of sauerkraut , dice up some potatoes then lots of big chunks of onions and buy a parsnip or 2 , boil and at last add sweet cream salt and pepper for taste. very good. My 18 yr. old grandson lives in Toronto.He came for a visit recently.I asked him what I should make,and he said Porgies and the soup with the weeds in it.He meant summer Borscht...HE LOVED IT! !And I loved making it for him! !If I might add,I also make it with frozen spinach, as the beet leaves are rather scares in the winter. Was browsing through MGCC this afternoon as I often do since I found this site.... what a delight! Thank-you so much. I'm a "Menno" too but didn't grow up with Summa Borscht. Perhaps my Dad was not accustomed to it when they married, because Mom always made Cabbage Borscht. Then my sister married a guy who would only have Summa Borscht, so we were re-introduced to it through her when she learned how to cook it from her mother-in-law. My Mom started to make it as well, and now a number of us also cook it, and relish it! I don't have access to Sorrel either, and have used beet leaves as well as spinach instead. I also use good old Mennonite Farmer sausage in place of the ham bone. And lastly, when the potatoes, meat, greens (lots of dill and parsley) are cooked, I add a good bit of buttermilk- at least 1/2 litre (2-3c. ), and heat through before serving... Mmm-MM! Yes I thought the weedy thing my mom used was LOTS of dill....and leave them long...ha ha. Never liked it growing up but now have lots of dill. 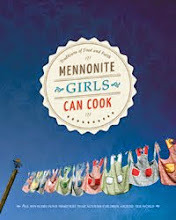 we live in Illinois so can't get any Mennonite sausage. Mom always bought it from Morden Manitoba. Ever heard of klieta mousse? It's the one with flour thrown in while the soup is boiling. Didn't like that one either but will make it anyway now that I am a Grandma. Definitely rushing to mom-in-laws' tomorrow to strip her sorrel plants! Chard works well as a substitute, too. But eggs??? Must be a regional thing - it's never occurred to me to add that to Summer Borscht! Like I tell my kids though, "Never say,'never'"
My grandma said spinach leaves can also be used in place or sorrel, and my mom said to add a tsp or so white vinegar to compensate for the touch or sourness the sorrel adds. I love the soup, and the memories of my grandma always having some in the freezer to thaw when we visited. I am wanting to make summa borscht soup. Does anyone know if it can be canned or frozen afterwards? My recipe calls for using buttermilk or heavy cream. yes it can be frozen, but it's never as good as fresh as it goes kinda soggy, i use sweet cream, or u can use sour cream just in your bowl, whatever taste you like. we always used beet tops never tried anything else. and tons of dill for the best summer borscht ever. I can mine every year using beet leaves, just make sure to follow instructions and times for low acid foods- greens and meats in the canning books. A pressure canner is a must, as well as following regulations such as not canning dairy etc.. I add my buttermilk when I open them up to heat and serve in the winter months. Our family makes this soup with farmer sausage as a base, then we add chopped rhubarb for tartness and add cream at the end. No eggs!! This is a summer favorited. We also use Swiss chard leaves sometimes. Serve with roll kucken and watermelon to complete the meal. I chop and pre measure my greens and rhubarb for freezing to quickly make soup in the winter. My mom used to make Moos using cooked Sorrel instead of goosberries. I got the recipe from her and now a few plants of sorrel are a staple in my garden! Thanks for posting this recipe. My mom always made it with spinach instead of sorrel. She also used milk instead of sour cream, but I think I'll try the sour cream. To get the "sort of" sour taste if I don't have sorrel (zurump) or buttermilk, I have found that Knorr Tamarind soup mix is a great substitute. It comes in a packet, like other Knorr soup mixes. Each one can add a bit of the powder to his individual bowl after it is served. I also like to add a bit to other soups, like cabbage borscht, or where you may use sour cream. I love weed soup, im not of mennonite descent but my first boss made the best weed soup in the spring. She would come in from the garden with a handful of weeds she would call them, i fell in love with it then. I have tasted other cooks recipes and was never the same. 25 years later i finally did it today!! !Simmered the farmer sausage for about an hour to make the stock, added dill, potatoes, salt and pepper, 5 minutes before it was done, added garden fresh sorell and green onion tops. Then tempered sour cream before adding to soup, no curdling. I am in heaven!!! My mom in law said they collected the "weed" which is a wild sorrel that you can find in ditches I'm also thinking young nettles might work. Does anyone know about this? Weed soup ... never heard that before comical for sure! I started using Swiss Chard and Spinach in place of the sorrel. Nice to read of different variations ... different regions probably. Interesting how so many families have "let go" of a lot of their traditional Mennonite meals...and then love to come back to them later. This is still one of my family's favourite soups. At our house it must be accompanied by sheet apple pie or Schnetji. So good. Also, I use whipping cream and vinegar to take the place of buttermilk or sour cream, and I have always used beet leaves instead of sorrel. I simply prefer them. In the summer I make small packages(dill, onion greens and beet leaves all rolled up well in a small rubber band)and freeze them (well packaged so the smell won't transfer). Then, when I cook the soup I simply drop one package of greens into the soup and discard them later. No wonder we don't call it a weed soup! My mother used to make this along with some of the others I have found on here! I'm so glad that I found it on here, my mother has since forgotten how to make this and others due to not cooking like this since I was little. 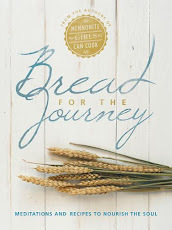 Thank you ladies for all these recipes! I found that beet greens and sorrel both freeze nicely. I package them up in ziplock baggies in the right amount for a pot of soup after I have chopped them up. Same as buying frozen spinach but "greener" because you used up what might have been thrown out. I just made a 12 qt. pot of summer borscht and found a baked smoked picnic shoulder adds more flavour than mennonite farmer sausage, beet leaves, Lg. onion, onion tops if you have, dill. I jar it hot and refrigerate. When I want a jar of soup I add 1 cup buttermilk and 1/4 -1/2 cup cream per 1/2 gallon jar. If I don't have butter milk I use sour cream or a combination of all three. Boiled eggs in this soup is new to me but my sister's husbands family grew up with boiled eggs in this soup. Most people love this soup even if they are not Mennonite. Wow, I love checking out all the variations of this soup! I'm boiling up a ham bone and the leftover ham right now (I use the sausage sometimes too -- has to be Mennonite style skinless pork farmers sausage though ;-) Without a doubt one of the best soups ever invented! My mom taught me to make Summa Borscht with pearl barley. Reduce the potatoes to 1 or 2 and add 1/2 cup barley. And about the egg -- in my mom's family they poached an egg per person right in the soup before serving. Poach them til firm - about 15-20 min. Then carefully ladle an egg into each person's bowl and fill the bowl with soup. Pass the sour cream. Fabulous! Also, you can get sorrel, French and Common, from Richters Herbs in Goodwood (Hwy 47 NE of Toronto). They're online and also sell seeds. Zumma borscht has always been a treasured favourite & the only Mennonite dish I make. If you can get it, Winkler Manitoba sausage is ideal. Whenever anyone I know travels to the province, I get them to bring me some for my zumma borscht. I have never used beet leaves before but I bought to make beet pickles, someone told me you can use beet leaves in soup. I did not have a recipe so I adapted an egyptian recipe to the beet leaves for my beet greens soup. In Egypt, one of the national dishes is Mulukhiyah s soup made out of mallow leaves boiled in chicken stock. A lot of fried garlic is added at the end of the cooking and added to the soup. It is served with soft pita bread and baked chicken on the side. Mulukhiyah has a very distinctive taste and its liquid is a thick, highly mucilaginous broth. Mulukhiyah's leaves are rich in betacarotene, iron, calcium, Vitamin C and more than 32 vitamin and minerals and trace elements. The plant has an potent antioxidant activity with a significant α-tocopherol equivalent Vitamin E. the mucilage of mulukiyah is perfect as natural laxative, and treat a lot of digestive problems. Mulukhiyah can be bought frozen in middle eastern grocery stores. I grew up with my great grandma and summer borscht was a staple in our home. She used beet leaves and added bay leaves as well. Never did add the eggs though. We also added buttermilk to our bowls at the table. She passed away before I was able to learn the recipe. Thanks for posting. I have been craving this for years! Wow, couldn't believe how many people knew about summa borscht. My mom died when I was young, so my dad continued to make her recipe. He taught my wife before he passed and I took it over from her. Our kids love to come for borscht. I use smoked pork hock or leftover ham bone and the Winkler smoked sausage. Previously I would get Winkler sausage from my sister in Winnipeg but have found a Foodland grocery store in Virgil Ontario that carries it. I freeze the dill and beet tops for one pot batches. I also use bay leaves, peppercorns, and cooking onions when simmering my broth. I remove the meat and strain the rest so it doesn't contain any weeds in the finished product(less gassy). I also never add salt until the very end as the ham imparts a lot of salt to the soup. I cut up the meat and return it to the pot with cut-up potatoes and carrots and simmer until tender. My parents would add buttermilk to their bowls but we prefer it without. We freeze it in meal size portions. My mom would serve it with fresh baked buns but we purchase a fresh Italian loaf which is great for sopping up the broth. Never heard of the eggs either but sounds interesting. Ours may not be exactly as my mom made it but it always reminds us of family. I also love this soup, when I can't get any sorrel I put some spinach in a jar and ad vinager to it for a day. In our family we use beet leaves, buttermilk and heavy cream to finish. Sometimes with ham or farmer sausage; sometimes without. On occasion my soup gets a pinkish colour from the beet leaves. Any suggestions to prevent this? I love this soup! My step mother used to make it only she added buttermilk or cream to the pot. She also used a pork bone and farmer sausage instead of ham. One of my favourite soups!! If you happen to live in the Chilliwack BC area, the new market on Lickman "The Local Harvest" carries Sorrel. Just found it the other day... just in time to use with my ham stock from the Easter dinner. Yum!!! 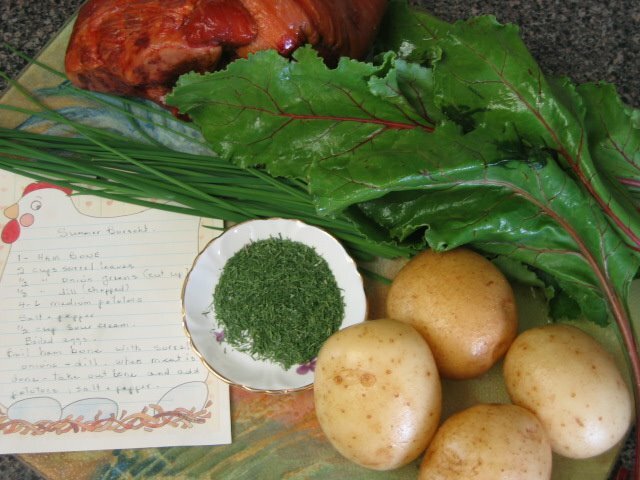 I am so happy to see this recipe, my mother called it sour grass soup and used wild sorrel. My Mom used to make this and I really liked it. Have trouble finding sorrel but will have to search some out. My Mom also used to make something she called Sorrel Moos. Are you familiar with that? It was cold, had sorrel, raisins and was thickened with corm starch and it was sweet. I really liked that as well. Thanks for always posting recipes that remind me of home. If you type in sorrel moos in the recipe search you will find the recipe for this moos. My Mom used to cook this and now I do..it's a favorite of mine. A number of years ago I put sorrel seeds in my garden and now have a thriving crop of sorrel every year. I used to have sorrel growing in my back yard, it was a perennial and came back (bigger!) each year. Now I've moved and want to get it started again, but I've only been able to find an annual version in the greenhouses here (Pittsburgh). It's called "Raspberry Dressing" sorrel. It looks like it will be very pretty, has red stem and veins, but hoping it has the same tangy flavor as the regular perennial variety. Also, my grandmother often used beet leaves, and added a stalk of rhubarb to add the sour/tangy taste. Back then I refused to eat it, thought it just looked slimy and icky. But eventually grew up enough to taste it and discovered that I love it! Delores, I wish you could come to my house so I could dig out part of my plant for you. I also have the red stem version and it has come up year after year so maybe yours will too!